The 258-page work presents a glimpse into the history of one of Toledo’s most important ethnic groups. Several chapters were written by Borden, who holds a PhD in history from Indiana University, Bloomington, and a master of arts degree from UT. Others with chapters include UT alumnus Dr. David Chelminski, UT graduate student Dorothy Stohl, Jane Armstrong-Hudiburg, UT alumna Sarah Miller, UT graduate William Samiec and Margaret Zotkiewicz-Dramczyk. Congresswoman Marcy Kaptur also contributed a chapter on the history of her Polish family, including the story of her father, Steve, who was known in the community as “Kappy.” Kappy began his career as a trucker and produce dealer in the 1930s; in the 1950s, he and Kaptur’s mother, Anastasia, opened the Supreme Market in Rossford. The market sold Polish specialty items. Kaptur also recounts several trips she made to Poland to visit the homeland of her ancestors, and how moved she was by the Polish people and their struggles throughout history. One such tale is told by author Stohl, who recounts the heart-wrenching story of Frances and Tadeusz Stocki, who lived in Poland during World War II. The couple married just as Poland was being divided between the Germans and the Russians, and they were imprisoned in a Russian gulag. The story of the couple’s efforts to survive, how they were separated and amazingly reunited, and how they eventually ended up in Toledo is a tale of unimaginable hardship and enduring love. Tadeusz was a janitor at UT for several years. The book also looks at the artistic expression of Toledo’s Polish community in its polka music. The chapter by Zotkiewicz-Dramczyk looks at some of the beloved polka bands that played in many venues around Toledo. It includes interviews with some of the bands’ leaders and discusses the evolution of Toledo’s polka music. A listing of polka recordings by Toledo bands also is included. In addition, Zotkiewicz-Dramczyk discusses the influential Toledo Polish music radio show hosted for years by Chet Zablocki, assisted by his wife, Helen, and then after Helen’s death, by his second wife, Sharon. Other chapters look at Polish wedding traditions, the role of local Catholic sisters in educating the new immigrants to Toledo, and the experiences of those growing up in Toledo’s two Polish neighborhoods — Kuhschwantz and Lagrinka. 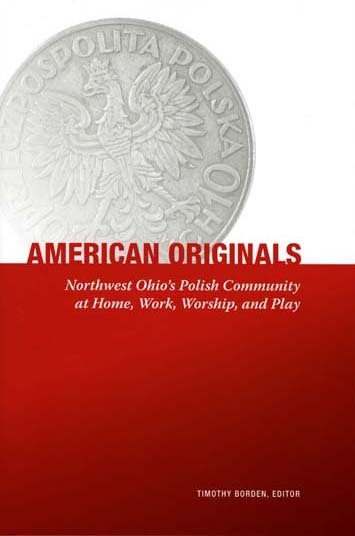 “American Originals is an important contribution to scholarship about Toledo’s history, and is also a fascinating read for anyone who is a part of the Polish community, or just an admirer,” Barbara Floyd, director of UT Press, said. The book is for sale for $22.95 from the UT Press website, Barnes & Noble University Bookstore at the Gateway, or by contacting Floyd at 419.530.2170. This entry was posted on Monday, July 14th, 2014 at 3:45 am and is filed under Alumni, Library, News, Research, UToday .